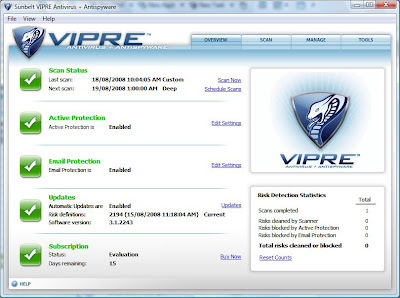 Vipre a brand new Antivirus completely designed and developed by Sunbelt Software from scratch. VIPRE - (Virus intrusion protection Remediation Engine) combines of antivirus, antispyware, anti-rootkit and other security tools. This anitvirus uses award-winning CounterSpy antispyware to defend and eliminate spyware from computer. Sunbelt Software offers a 15 day free trail for public.Price is $29.95. 1. Vipre protects against highly complex viruses, adwares, spyware and other threats. 2. Vipre is designed to run on low system resources. 3. Uses award-winning CounterSpy Antispyware technology. 4. Real-time monitoring with Active Protection provides Kernel-level protection against known , unknown threats and its execution. 5. Full protection against email-borne threats. Scans commonly affected areas of your computer. You can set additional scan parameters through Scan Options link, Like scan inside archives, cookies etc. Select Deep System Scan to perform a thorough scan of all areas of your computer. Scans specific areas of your computer only, including running processes, registry files, cookies, and particular drives and folders. This tool remove your browsing and search histories, including the history stored by many applications. Viper file eraser tool remove files permanently form a storage device. Files removed by Viper cannot be retrieved by file/data recovery utilities. The PC Explorer screen allows you to view settings on your computer that are normally hidden. This tool displays Downloaded ActiveX , Internet Applications, Running Processes, Startup Programs, Internet Explorer BHOs, Window's Host Files, Window's LSPs, Shell Execute Hooks etc. Esmu loti apmirinats ar pirkumu citiem ari iesaku!